InCHIP offers a large variety of services to its membership. To see what services you qualify for, click the "Get Started!" button. InCHIP serves as a nexus for investigators at the University of Connecticut and other institutions to stimulate collaborative partnerships for the development of major research initiatives in health behavior change. InCHIP has created a multidisciplinary network of more than 480 affiliate investigators with expertise in health behavior change and intervention. This network of affiliates spans several University of Connecticut campuses, representing nearly all Schools and Colleges within the UConn system, and it also draws from more than 60 other research institutions. The network enables InCHIP to assemble teams of investigators able to respond within short time frames to large-scale research funding opportunities as they arise. 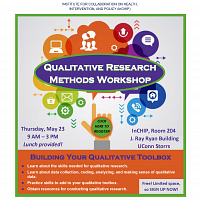 See https://chip.uconn.edu/2019/04/05/21916/ for a description of the workshop. InCHIPâs Ideas Lab is designed to engage teams of interdisciplinary researchers in tackling âwicked problemsâ by exploring new ways of thinking about, studying, and generating novel solutions to these complex issues. The focus of this Ideas Lab is to generate and examine questions such as: How can we better utilize wearable, mobile-based, and other data-rich technology to promote health and well-being and ultimately prevent and manage chronic disease in an ethical and legally sound fashion? We invite experts from a broad range of disciplines to join us in this work, including but not limited to: behavioral, social, biomedical, and environmental sciences; engineering and mathematics; policy and law; business; education; the arts and humanities; or any other discipline that can provide new insights and perspectives on this topic.